Guided Salmon Fishing Adventures on the Lower Pere Marquette River. Great News! 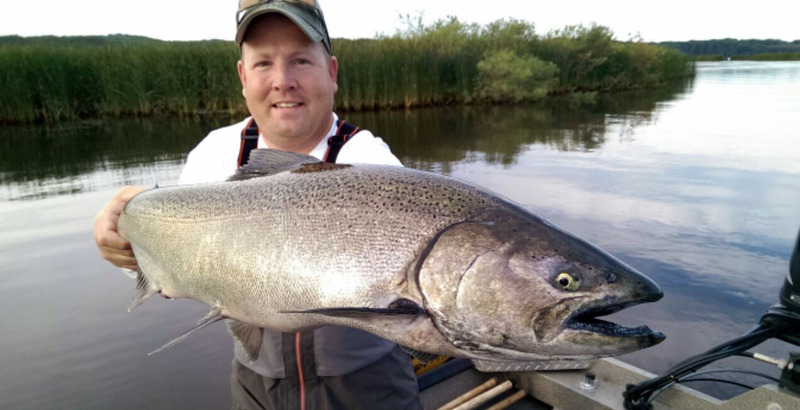 Fall salmon fishing should be excellent this September on the Pere Marquette River. Charter boat captains out of the Ludington Port are reporting record catches of salmon in Pere Marquette Lake, and Manistee. This should offer excellent fishing opportunities for us in the lower river. We guide the Custer – Scottville section of the PM River for King and Coho Salmon during September. We still manage to land limits of salmon but this year, fishing should be a whole lot better! Two of our favorite techniques for early season king salmon on the lower Pere Marquette River are: Casting Thunder stick crank baits, or fishing salmon skein under a float. Bobber fishing is best done during the middle of the day while salmon are in the holes. Thunder stick fishing is best done in the early morning while salmon are on the move. 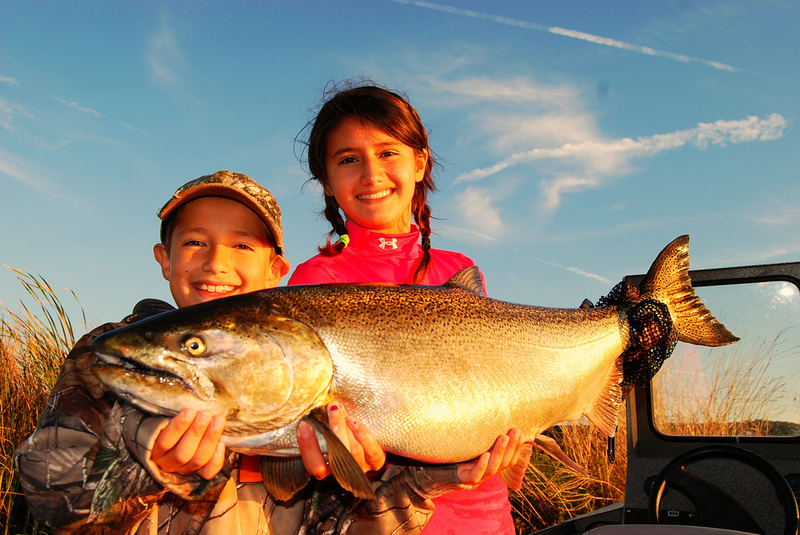 The best Michigan Salmon fishing is yet to come! Early September offers bright chrome Kings on light tackle and fly fishing. The Pere Marquette River has long since been renowned for great salmon fishing, especially during the early season. Casting deep junior thunder sticks, crank baits, and drifting skein salmon eggs under a bobber produces the most fish on. Fly Fishing in the upper section also produces a pile of big salmon in the “Flies Only” catch and release sections. The Pere Marquette River offers the finest in fly fishing for Spring Steelhead, Summertime Trout, and incredible Fall Chinook and Coho Salmon. This peaceful and scenic river winds through a canopy of towering jack pines, medows, and untouched Manistee National forest. Home to the largest migrations of naturally reproducing spring, fall, and Skamania Steelhead ascend this river for quality spawning gravel. The Pere Marquette is home to the largest natural occurring run of Chinook Salmon. Hard charging andromous salmon that early take drifted skein under a float, or flies drifted along the bottom. Big numbers of King salmon, Coho, lake run brown trout, lake trout, and walleye on the Pere Marquette River. The Pere Marquette River is a world class river for trout and steelhead but, is also our favorite river for early season king salmon on the fly rod. 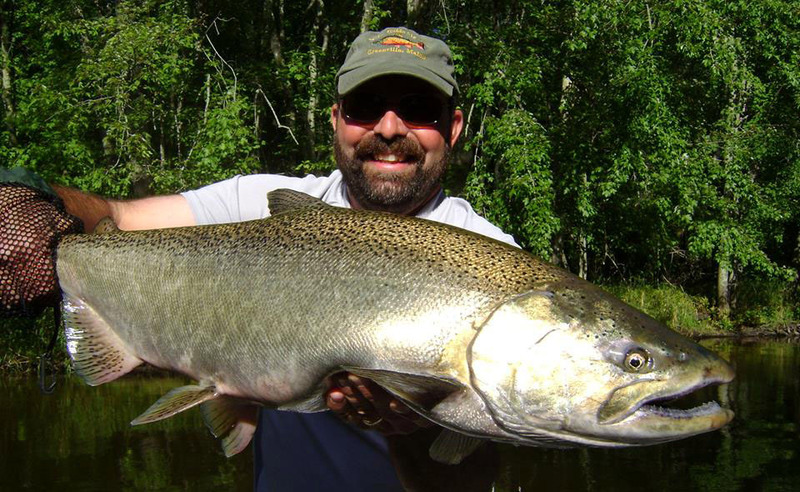 Late August and September offer exceptional salmon fishing! Trout fishing on the Pere Marquette River is outstanding year around. 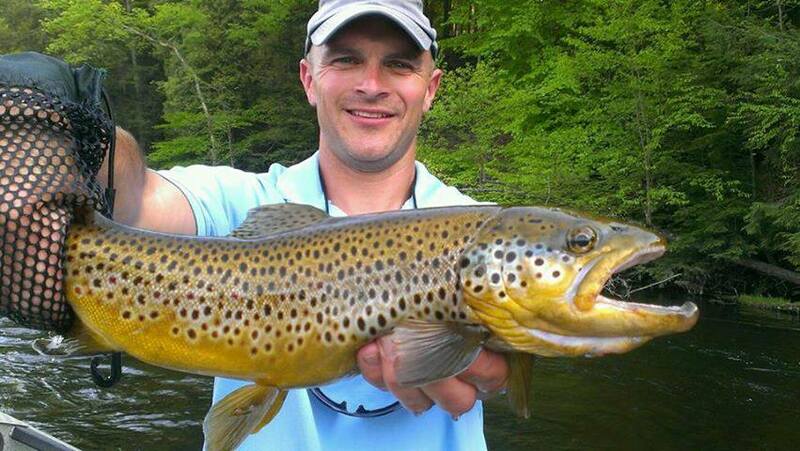 Trophy resident brown trout haunt the log jams and gravel shoals, feeding behind the spawning salmon and steelhead. Species in the Pere Marquette River vary in the different sections of river. The “flies” water is loaded with resident trout ranging from 8″ to 12″. The mid section from Gleason’s to Walhalla has a good mix of bigger Trout, Steelhead, and Salmon fly fishing. The lower section, Walhalla to Scottville has the famed “Hex Hatch” and is home to early “Kings” in late August. The number of Chinook salmon the Pere Marquette river receives in late August and September is truly amazing, with salmon reaching 30 pounds!! 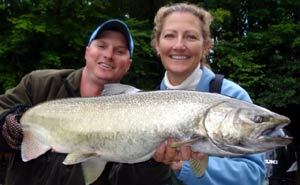 Pere Marquette River Salmon fishing guides available for the lower stretches of the PM river. We prefer to guide hardware, bait caster, spinning, and fly fishermen for Salmon on the Pere Marquette River. The Pere Marquette River is best floated with a drift boat or raft but is also easily waded. The bottom is a mixture of sand and gravel. There is ample spawning area located in the “Flies Only ” section. This makes the river a perfect location for Michigan Fly Fishing.